We started off day three by heading to the pool in the morning to try to catch some sun. “Try” is right. The New York New York pool – essentially a slab of concrete with a hole with some water in it – doesn’t get any sunlight until way after 10am. Even then, we had to sit on some steps off the deck to be in the small section of sunlight that fell there. 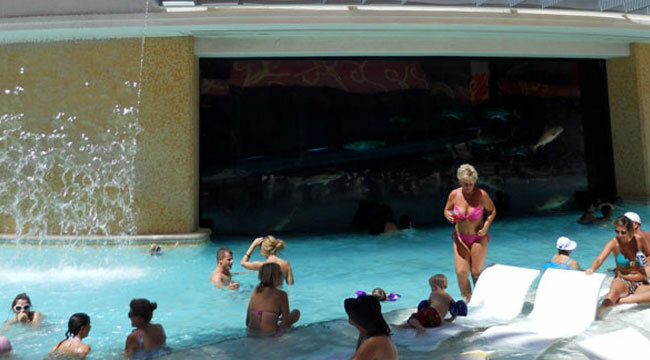 At a time when even old Vegas hotels have destination pools (Golden Nugget has in-pool seating and a shark tank), New York New York’s is in need of a makeover. From there, we set out for old downtown. The Deuce, a 24-hour double-decker bus that runs the length of The Strip, goes all the way there and a ticket is only $7 for a day of unlimited riding. So, we bought our passes at the kiosk near the bus station and took The Deuce down there, sitting front and center on the second level so we had a great view. Downtown Vegas and the Fremont Street Experience is old school, but that’s part of the charm. Most of the vintage neon signs you see there are actually part of the Neon Museum, a non-profit devoted to preserving this part of Vegas’s past. (You can make an appointment to tour their neon graveyard where old signs go to rest until they can be restored.) We snapped a few shots of them and read the placards detailing their histories. We dropped in at the Golden Nugget to check on its updates (taking a few minutes to marvel at the aforementioned shark tank in their packed pool area), watched a few people fly overhead on ziplines and checked out the 1980s outdoor concert series lineup for the summer, before stopping at the Main Street Station Casino and Brewery for a drink. At the casino bar, their microbrewery beers only cost $1.75 a pop, a remarkable deal (and you can take them with you). Desperate for food, we hit up the Garden Court Buffet. While it’s certainly nothing exciting, it was cheap (costing less than $20 for the two of us) and fairly fresh. The tamales were especially tasty and appeared homemade. A jumper preparing to descend (quickly) from high atop the Stratosphere. On our return trip to The Strip, we got off at the Stratosphere, the hotel and casino famous for its giant tower. We had never been to the top, so we paid the $16 to ride up. The 360-degree views are tremendous and give you an up-close and somewhat uncomfortable look its various thrill rides, including the SkyJump, which lets crazy people fall the length of the tower to the ground while tethered to a cable. Even though all the high elevation, high octane rides look are extreme, this one in particular is a doozey. It took us about 30 seconds to fly up the elevator, we can’t imagine falling to the ground in about half that. After the Stratosphere, we hopped back on The Deuce and rode down to the Mirage where we had tickets for the Terry Fator show that were part of our hotel package. Before you give us crap for going to see the ventriloquist who won America’s Got Talent, remember that our other choice for free tickets was Criss Angel or the Excalibur dinner theater. Yeah, ponder that for awhile. And, while Fator may not seem particularly hip, he does have a a really unique talent. It’s pretty remarkable that he is able to imitate singers like Garth Brooks, Barbra Streisand, Etta James and Nat King Cole. That he can do it without moving his lips is even more remarkable. His show was very high energy and entertaining, and the big screen TVs give you a good close-up look at his ventriloquism skills. By the way, while you can’t film, he encourages the taking photos in the theater, which is a nice change. Tomorrow we’re looking forward to O, the only Cirque show in Vegas (save Criss Angel, and you know how we feel about that) we haven’t seen. Our top five long-running shows to see in Vegas? Any female impersonator show . . . they’re all fun. Note: We haven’t caught George Wallace and Viva Elvis was pretty fun too.